U.S. 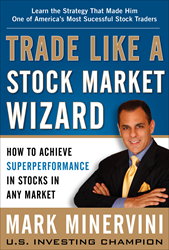 Investing Champion Mark Minervini – Author of the best-selling book Trade Like a Stock Market Wizard; How to Achieve Superperformance in Stocks – will be at Barnes & Noble in New York City (160 E. 54th Street & 3rd Avenue) – Thursday, March 10 at 5:30PM. Starting with only a few thousand dollars, Minervini turned his personal trading account into millions averaging 220% per year for five consecutive years with only one losing quarter. To put that in perspective, a $100,000 account would explode to over $30 million. During that period, Minervini also won the U.S. Investing Championship with a 155% return. Come meet a living legend in the investment community. Minervini will sign his best-selling tome Trade Like a Stock Market Wizard. You will have the opportunity to talk stocks and ask Minervini questions one-on-one. For those who buy a copy of Trade Like A Stock Market Wizard, Barnes & Noble will be giving away a free copies of Minervini’s most recent book Momentum Masters.